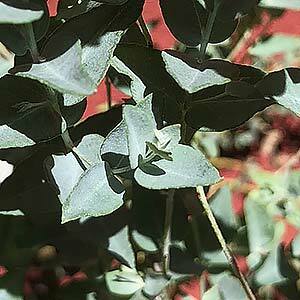 An Australian native plant that is used for the foliage, as well as a garden plant, Eucalyptus latens Moon Lagoon is a hybrid variety, believed to be a natural cross between Eucalyptus kruseana and Eucalyptus latens. It is used as low windbreak, small screening plant as well as the the foliage which is cut when young and valued in floristry. The red buds to orange that appear before the flowers as a nice red and last for a number of months before the flowers themselves open. This is a drought tolerant Eucalyptus that require little care once established. Pruning is recommended to maintain the new foliage which is regarded as more attractive that the mature foliage. Pruning involves coppicing the plant right back to the lignotuber every few years. Foliage – A good blue/green when young, a deeper green at maturity. Frost tolerant – Frost tolerant. Pruning – Regular pruning once established ensures that the attractive juvenile leaves are maintained.